If you use Google for email and to manage your contacts, then you can set up a wireless sync for your Google Contacts. This is a great feature because you no longer need to connect your Bold with a sync cable to your computer to update contacts changes between your Bold and Google. The contact updates, like email, all happen automatically and wirelessly. A new feature with BlackBerry 5.0 system software and BlackBerry Internet Service software (assuming your carrier has upgraded) is that you now can select wireless contact syncing for Google. To do so, follow these steps. You can also sync your Google Contacts using the Google Sync app (see page 305). Do not try to sync Google Contacts with both methods—you are asking for trouble. 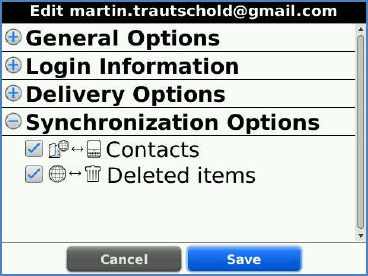 Instead, if you choose to use this method for contacts syncing, then use Google Sync for only your Google Calendar. If you forgot to check this sync box on the first-time setup, you can get to it in the Edit email account area shown on page 41. Highlight your email account from the main list of accounts, click the trackpad, and select Edit. Roll down and click Synchronization Options as shown here, and check/uncheck your boxes. The first time you enable this contact sync feature, you will see a screen showing you the progress of the initial sync. If you have many contacts, (for example, 1,000 or more) it could require over 10 minutes to finish the first-time sync. You may also have to try it a few times if it fails the first time. As of publishing time, this only worked with Google/Gmail accounts, but we believe more account types could be added in the future. If you have enabled wireless contact syncing with Google or another service, you can adjust the sync from your Contacts Options screen, as follows. Click your Contacts icon, press the Menu key, and select Options to see this screen. 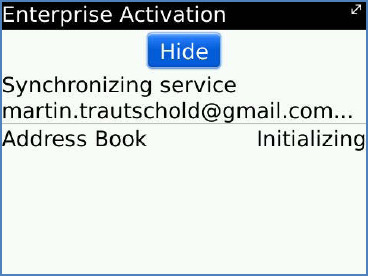 Now, roll down and click on the email account under the Contact List to make adjustments using the screen shown. If you want to disable Wireless Synchronization, change the Yes to a No by clicking on it or pressing the Space key. 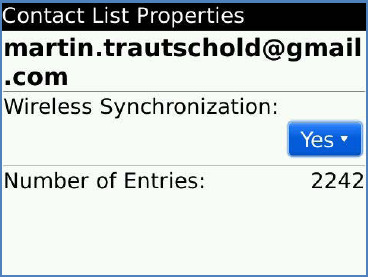 This screen also shows you how many contact entries are being synced. Save your changes. Make sure you are trying to sync a Google Mail account; at publishing time, no other services allowed syncing of contacts. As of publishing time, you could not sync Google Mail contact groups. 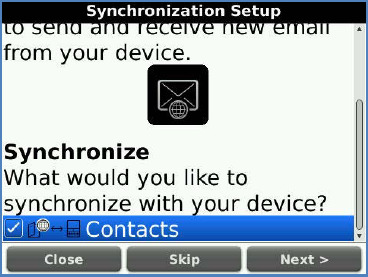 Make sure you have enabled Wireless Synchronization on your BlackBerry smartphone. To verify this, start the Contacts application, press the Menu key, and select Options. 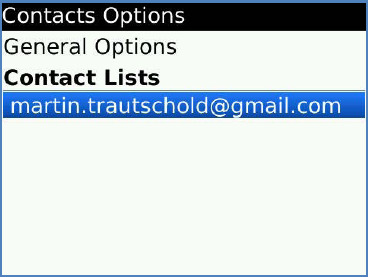 Scroll down to and click your Gmail address under Contact Lists. The setting next to Wireless Synchronization should be set to Yes (see preceding steps and images).